What a year it has been for Ryanair Cabin Crew. AGB training, new improved VPOS sales device, new uniform, new Boeing sky interiors, new bases, hundreds of promotional opportunities, and a new deal for 2016 with a fixed 5/3 roster, more time off and pay increases set out for the next 4 years… AGB –Over 90% of Number 1’s have now completed their training, all new recruits now complete AGB as part of initial training and all remaining crew will complete their AGB training by the end of 2016. Sales – New VPOS devices were introduced July last with a major uplift in sales bonus for crew across the entire network. We can now better identify pilferage, and shortages at Bond’s meaning less adjustments and more sales bonus for crew. Sales bonus has risen on average by 20% since August with top sellers regularly earning in excess of €1,000 per month in bonus. We have also worked hard to source products that you can easily sell, with cracking offers, particularly on fragrances. Well done to all of our crew on an outstanding 2015 let’s make 2016 a blowout year for sales. Roster: A great set of numbers on rosters this year with average hours of 71 hours per month to date. The average ‘nines’ per crew member across the network was less than 2 per year, annual leave has been planned in full and there has been less unpaid leave as our schedule has become less seasonal. New EASA FTL’s are coming February next which makes the existing 5/2 5/3 hugely disruptive. Those bases who have voted to accept the new deal, will get a fixed 5/3 roster, which means an additional 15 extra days planned away from the company, with more roster stability, avoiding the significant disruption caused by the retention of the 5/2 5/3 roster from Apr 1st next. Transfers: The Winter transfer window will commence on January 18th when we know the final number of crew who have accepted the new roster. To date over 92% of crew are covered by the new roster agreement. We hope to transfer up to 400 crew to their base of choice, building on the 400 crew already transferred during the summer 2015 transfer window June last. Remember base transfers are granted on merit and that means sales, customer service and flexibility. If you’re the best, you’re first on the list. New Uniform: The New Uniform is here at last, chosen by our crew. Stansted and Dublin are first to launch Feb 1st next. ERC’s pushed hard for a free once off replacement uniform while retaining the annual €400 allowance. All bases will receive their new uniforms before the start of the summer season. Unfortunately those bases who haven’t accepted the new deal by January 15th will in accordance with section 5 paragraph 2 of the current agreement have their €400 allowance reduced to pay for the new uniform from their existing allowance. New Deal – The new 5 year deal has been accepted by over 92% of crew. Demonstrating that crew clearly recognise a very good deal on pay, rosters and time-off. Given that the new deal has such widespread acceptance and the preparation of rosters for the imminent FTL changes is almost finalised, we will be closing acceptance of the deal for those bases who haven’t yet voted by Jan 15th next. ** ** ** ** ** ** ** ** ** ** ** ** ** ** ** ** ** ** ** ** ** ** While it has been a very good year for Inflight we continue to see how vulnerable our industry is to external shocks, particularly in the aftermath of the Paris terrorist attacks, and we must continue to work more efficiently than our competitors so that we are best placed to respond to any external threat to our business, whatever they may be. We plan to fly over 5m passengers between Christmas and the New Year. Remember crew are the first people that our customers meet and your service and interaction on board forms their view as to whether they will continue to fly with us. At Ryanair we offer the lowest fares, the best punctuality, now we want our customers to know we have the best crew, delivering the most outstanding customer service in the industry. Wishing you and your loved ones a very Merry Christmas and a Happy New Year, and I thank each and every one of you for your effort and commitment over the last 12 months, and look forward to working with all of you in 2016. The on board sales scam above is from Ryanair's Director of Personnel Eddie TERMINATOR Wilson a few days ago who has Terminated thousands of young probationary cabin crew at Ryanair for PROFIT. Wrecking the lives of so many. Mr Wilson is one EVIL person. See him being confronted by me below. Wilson talks about pay increases but what he will not tell you is, pay increases will only effect 20% of Ryanair cabin crew but will give no details. 80% of cabin crew are contracted through Ryanair shell companies Crewlink Ireland and Workforce International who have no say.Wilson said regularly earning in excess of €1,000 per month in bonus for selling products on board but what he will not tell you, Ryanair keep all commission records with cabin crew not given sales commission records. Wilson Biggest LIE he states cabin crew can Regularly earn in excess of €1,000 per month commission on selling,(20% commission given) so he is saying cabin crew sell €5,000 per month in on board sales. Given a 5/3 roster average days a month flying being 20 - home stand by's which are un paid average of 6 a month gives cabin crew on average 14 days flying to sell €5,000 worth of goods on board. This works out at a selling rate of €357 a day for each cabin crew member and they are 4 cabin crew on each flight. Look at the breakdown below. 1500 flights a day with 4 cabin crew members all selling €357 a day = €1,428 a day x 1500 flights = €2,142 million. x 358 days a year flights = sales of €766,836 million a year. In-flight Sales for Fiscal year ended 31st March 2014/2015 was €128.1 million. Eddie Wilson is he telling the TRUE and slipped up here? Ryanair conning share holders. David Bonderman and Michael O'Leary scamming on board sales which brings them in €millions each week. So never mind the safety of crew and passengers on board after the Paris terrorist attacks, just SELL SELL SELL Shocking comment from Ryanair. 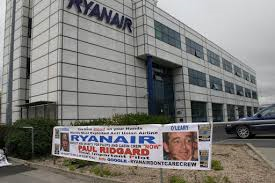 Lives of crew mean nothing to Ryanair just Google Ryanair Suicide Pilot Paul Ridgard. Posted today 30th December 2015. NICE TO SEE THE IRISH STOCK MARKET LOOKING AT THIS POST TODAY. The very same way as the on board Ryanair charity scratch card SCAM..Inflated sales pitch by Wilson to increase share prices and he has signed it..